Another winning recipe from Suas’s Advance Bread and Pastry cookbook, Croissant made with Natural Starter (sourdough starter). So far, I have made croissants using four different formulas; one with preferment, one with poolish, whole wheat croissant and the latest into the repertoire, croissant made with natural starter. I considered this batch my new PB (personal best) as it gave the most wonderful and flavoursome croissants, and the best looking ones tooJ. Contrary to what you might be thinking, that sourdough starter will produce sour taste croissants. This is not the case at all. The amount of starter was small enough not to give the acidic taste, but in the meantime, it was enough to enhance the flavour. If you have sourdough starter, I encourage you to give this recipe a go. 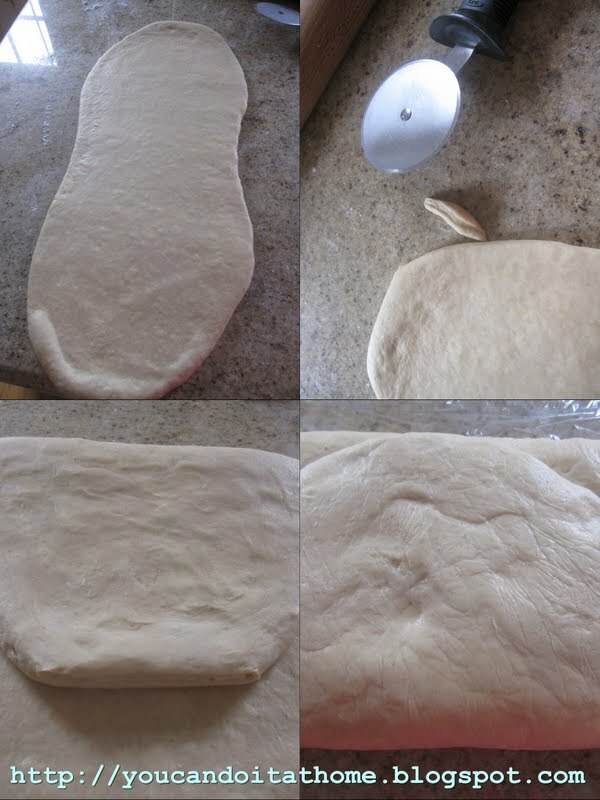 Though there is a little extra step to prepare the starter dough (using natural starter), it is very well worth it. Because Suas’ book gears towards professional, adjusting the recipe to a domestic batch size involved some math works. The recipe also didn’t include roll-in butter (for lamination). Converting the recipe to the homemade batch size resulted in tiny amount of egg used in preferment and half-egg in the final dough mixing. I omitted the egg in preferment altogether and used half of one egg in the final dough and the other half for egg wash. The dough was a breeze to work with in the rolling and laminating departments. I'd like to believe that having sourdough starter and preferment contributed to the pallable and strong dough. 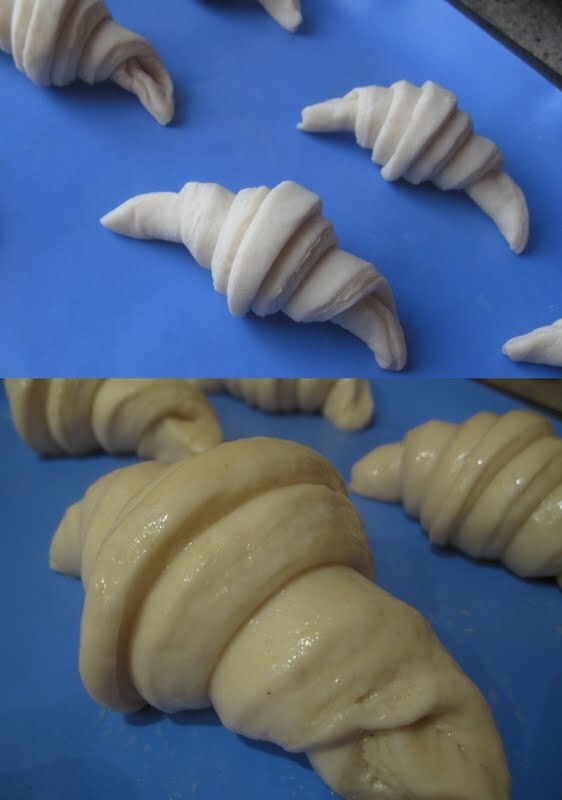 Making croissants might sound daunting and involved but it is achievable and the results are truly rewarding. Fresh homemade croissants will beat any great commercial croissants. It made the perfect weekend for us and I'm sure it will make yours. I omitted the small amount of egg in the first dough (preferment). The final dough used half of an egg. I used the leftover half as an egg wash. The original recipe calls for osmotolerant yeast, which I didn't have access to. I used instant dry yeast and increase the amount by 20%. Croissant achieved great volume which could have been the result of sourdough starter in addition to dry yeast. Make Italian levain dough - mix all ingredients together until well combined and becomes a dough ball. Cover and leave at room temperature for 12 - 14 hours. Make first dough (pre-ferment) - mix all ingredients together in a bowl until it becomes a ball. Knead it for about few minutes. Cover and leave at room temperature for 12 - 14 hours. Put the dough in a bowl covered with plastic bag or cling wrap and ferment at room temperature for one hour. After fermentation, refrigerate the dough for one more hour or retard overnight. Take the croissant dough out of the fridge. Flour the working area well. Using a lightly floured rolling pin, roll the dough out into twice the size of butter block (roll-in butter). Place the butter in the centre of the dough and fold the dough over the top. 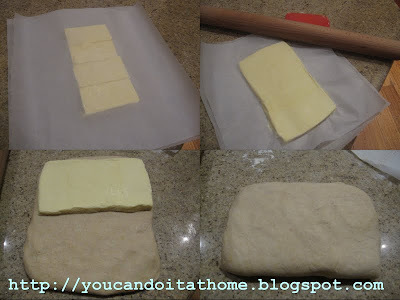 Seal the edges of the dough together to ensure the butter is completely enclosed in the dough. Flour the work area and rolling pin well. Gently and carefully roll the dough out into a rectangle three times longer than the piece you started with. Mentally divide the rectangle into three equal sections, top, middle and bottom. Fold the top section over the middle, and fold the bottom to the middle, like folding a letter. This is the first turn. Wrap the dough in a plastic bag or cling wrap and refrigerate for (at least) 30 minutes. Trim the edges of the dough so that it becomes a neat rectangle (the scraps can be made into chocolate croissants). Doesn't it resemble Eiffel Tower? I think margarine will work. In fact it would be more workable than butter as they not melting. However they won't be as nice as butter. I'm traveling at the moment but will check your post out soon. The flavor sounds great. I love to try making on with violet too. hi sue, i must say that you're really very knowledgeable in all these bread making and croissants. I love all your rustic looking breads and i would like to try making sourdough breads one day. Sue if you dont mind,can you tell me which post of yours should i refer to for basic sourdough making? Thank you Lena. It was very sweet of you to say. The post below is a good start for plain sourdough, it's also a simple and flavorsome bread. If you prefer all white flour, you can omit wholewheat and replace them with bread flour. Susan at WildYeastBlog also posted a good collection of posts about sourdough making. It's worthwhile to check it out. Sue, I did bake Tartine's Morning Buns and off course my first croissants with your great explanation. Thank you, they were delicious and looked beautiful. Now I'm ready to post about the croissants. Your recipe is so great, can I use it as it is and off course give you all the credits? As I would anyway. Or should I re-write it using my own words? Glad to hear that your attempt on croissant went well. They were such delights, weren't they? Off course all credits go to you. Your blog is a place full of nice recipes and beautiful baked goodies. Thanks Connie for kind words. Yours looks great for the first attempt. Thank you for the lovely recipe, just wanted to ask what is the purpose of making pre-ferment into 8-10 small pieces? is it for adding it one by one with the final dough ingredients ? Dividing pre-ferment to smaller pieces ensures that they will be even distributed throughout the final dough.